Mmm, mmm! Steamy chicken goodness. 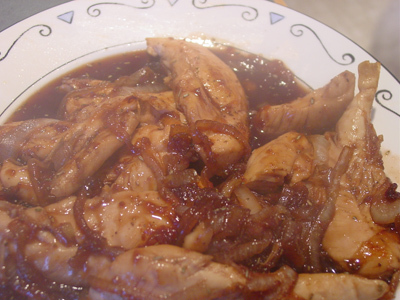 The original recipe is called Caramelized Onion Chicken but, frankly, this recipe doesn’t have enough onions in it to justify that name. I doubled the amount of onions called for, and it still was pretty skimpy. So if you like onions (and I do), throw in two to three medium ones, sliced. Having said all that, the chicken is delicious. There’s a hint of sweetness from the jam (I swapped homemade strawberry for seedless raspberry) but that’s balanced by the salt from the soy sauce and a tartness from the red wine vinegar. Minced ginger adds another dimension: all in all, a good meal. I paired this with roasted asparagus and balsamic roasted sweet potatoes. Sprinkle chicken with salt and pepper. Heat oil in a large nonstick skillet over medium-high heat. Add onion, and sauté 2 minutes. Add chicken to pan; sauté 8 minutes or until chicken is done. Remove onion and chicken from pan. Add jam and remaining ingredients to pan; cook 2 minutes, stirring constantly with a whisk. Return chicken mixture to pan; cook 4 minutes, stirring occasionally.